While there are many foods with good vegetarian and vegan equivalents (I’m looking at you, ice cream! ), it’s difficult to find a good vegan cheese. For years, whenever I’d find a new one in the refrigerated section at Whole Foods or the local co-op, I’d excitedly put it into my grocery cart and inevitably, my husband and I would hate it. Maybe something would have the texture of cheese but not the taste or the taste but not the texture–nothing was ever quite right. After having the opportunity to review Daiya vegan cheese, I have to say it’s the best substitute for cheese that I’ve used. Is it exactly like cheese? No. But it’s definitely the best vegan cheese I’ve ever cooked with because, unlike most other cheese substitutes, it actually melts. After putting the Pepperjack Style Shreds on baked potatoes just to test out the taste and texture, I decided to try making potato corn cakes with them. This is the perfect way to use leftover mashed potatoes and the Pepperjack shreds gives these fritter-like cakes a nice little kick. 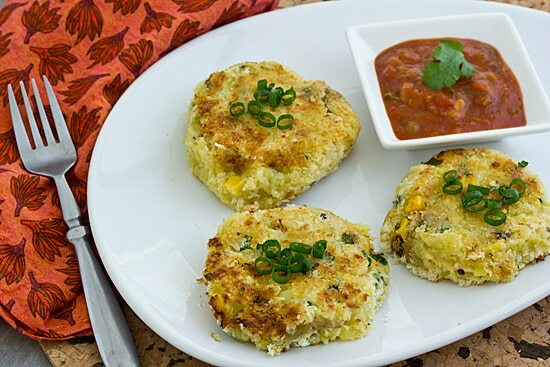 A Mexican-inspired recipe for cheesy vegan potato corn cakes using Daiya shreds. Add potatoes to large saucepan and cover with water. Bring water to a boil and cook about 10-15 minutes, or until easily pierced with fork. Drain and cool. While potatoes are cooking, heat cooking spray in a medium skillet over medium heat. Add corn and green onion; cook, stirring often, until corn is just starting to brown, about 7 minutes. In a large bowl, mash potatoes with soymilk until large lumps are gone. Stir in corn and onion mixture, cilantro, Daiya shreds, salt and pepper until well-combined. Allow mixture to cool slightly until it’s easy to work with. Spread panko on a large plate. Form 12 patties with the potato mixture and press each into the panko, covering both sides. Coat skillet with a liberal amount of cooking spray and heat on medium. Cook cakes approximately 4 minutes on each side or until browned. Serve with salsa. Disclosure: I received a sample of Daiya vegan cheese to facilitate this review, but all opinions are my own–I only review products on my blog that I truly love and recommend to my readers. No monetary compensation has been received. I love the flavor of pepperjack, so this sounds delicious! Wow this sounds great – vegan or otherwise! Yum! Good luck with transitioning over to veganism! This sounds like something we would enjoy. My husband often makes potato cakes out of leftover mashed potatoes, chopped onions, one egg and a bit of flour to hold them together. Thanks for sharing. I agree! We tried the all or nothing approach as well and it didn't work. We are now reducing our intake of dairy also. Cheese really is the hardest thing to find a substitute for!